Haiti has already begun to fade from the headlines. But for individual donors, the real opportunity to have impact has just begun. As Haiti transitions from rescue and relief to recovery and rebuilding, the most lasting change will come from nonprofits with at least one of two characteristics. The first is specific expertise in moving from immediate disaster relief to mid-term recovery to long-term development. The second is experience and a track record of results operating on the ground in Haiti. Both of these characteristics indicate a capacity for sustainable impact. In other words, supporting these models ensures that the impact of your donations will stick long after the headlines and the celebrity appeals end. The extreme poverty that existed in Haiti before the earthquake has made all efforts to help - including philanthropic ones - especially challenging. Haiti will need much more than high impact philanthropic capital to address its needs. However, the models and agents we describe below are focused on areas that represent the three pillars of effective development: health, education and livelihood. All address both mid-term recovery and long-term development, and all have operations on the ground in Haiti. Health - Comprehensive primary healthcare systems in Haiti have demonstrated impact in improving the health and well-being of the populations they serve, especially children. These programs utilize community health workers, mobile clinics and health educators to reach each household. They deliver both effective prevention, like immunization and clean water, and medical treatment. In addition, they are linked to quality clinics and referral hospitals when more advanced care is needed, such as trying to save a mother's life during complicated child birth. By emphasizing primary and preventive care, these programs can be not only highly effective but also highly cost-efficient. Two organizations currently implementing successful systems in Haiti are: Hôpital Albert Schweitzer and Partners in Health. Philanthropic capital can strengthen and replicate these models throughout the country. Education - In areas affected by the earthquake, the focus now is to move beyond basic child protection and emergency schooling to a more permanent education system. With an estimated 40 percent of the population lacking literacy skills prior to the earthquake and many schools destroyed in the last month, the education system needs not only physical rebuilding, but also investments to improve the quality and reach of schools. New teachers will need to be recruited to replace those who died. All teachers will need improved professional development and training to address the psychosocial needs of traumatized children. As in every country, a better educated society will be essential to effective economic development and a more accountable government. Two organizations that were first on the scene to address the needs of children are: Save the Children and the International Rescue Committee. They have already been planning for transitions to temporary and permanent schooling. Livelihood - Long-term poverty reduction in Haiti will depend on developing the human capacity, resource base, and environmentally sustainable opportunities for Haitians to earn a living and take care of themselves. This last issue is important as Haiti has one of the highest rates of deforestation in the world. Two models that philanthropists can support are cash-for-work programs and graduated micro-finance programs focusing on the marginalized poor, especially rural women. Cash-for-work programs address multiple levels: near-term, they're a way to clear the rubble and get young men actively engaged in clean-up operations; mid-term, they get cash into the economy and build self-sufficiency; and long-term, they provide job skills and community bonds needed for lasting recovery. Mercy Corps' cash-for-work program was instrumental in Aceh after the Tsunami. They now have a new program underway in Haiti. Graduated microfinance programs target the most marginalized by providing not only access to loans and financial services, but also access to basic literacy and business skills, start-up assets, like cows and chickens, and access to markets so that local enterprises can succeed. Fonkoze is Haiti's largest micro-finance organization. Its mission is to build the economic foundation for democracy in Haiti by providing the rural poor - mostly women - with the tools they need to lift themselves out of poverty. They offer a full range of financial services to the rural-based poor, currently reaching more than 225,000 savers and borrowers. Every disaster is different. However, these models and agents have all been able to match their activities to the specific needs on the ground in Haiti. 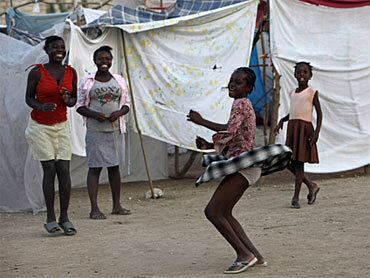 Equally important, they quickly involved Haitians in their own recovery and rebuilding. Research, experience from other disasters, and common sense all point to the latter as key to sustainable impact. And ultimately, that's what most donors aspire to - a positive change that continues even after they've moved on. Attention is already moving on from Haiti. By supporting these models, donors can make sure their impact sticks. Katherina Rosqueta is Founding Executive Director and Carol McLaughlin is Director of Global Public Health at the Center for High Impact Philanthropy in the School of Social Policy & Practice at the University of Pennsylvania.